We report a new method using re-designed guide RNAs with internal barcodes (iBARs) embedded in their loop regions. Our iBAR approach outperforms the conventional method by producing screening results with much lower false-positive and false-negative rates especially with a high multiplicity of infection (MOI). Importantly, the iBAR approach reduces the starting cells at high MOI significantly with greatly improved efficiency and accuracy compared with the canonical CRISPR screens at a low MOI. This new system is particularly useful when the source of cells is limited or when it is difficult to control viral infection for in vivo screening. The CRISPR/Cas9 system enables editing at targeted sites in the genome with high efficiency and specificity [1–3]. One of its extensive applications is to identify the functions of coding genes, non-coding RNAs, and regulatory elements through high-throughput pooled screening in combination with next-generation sequencing (NGS) analysis. By introducing a pooled single-gRNA (sgRNA) or paired-gRNA (pgRNA) library into cells expressing Cas9 or catalytically inactive Cas9 (dCas9) fused with effector domains, investigators can perform multifarious genetic screens by generating diverse mutations, large genomic deletions, transcriptional activation, or transcriptional repression [4–11]. To generate a high-quality cell library of gRNAs for any given CRISPR screen, one must use a low multiplicity of infection (MOI) during cell library construction to ensure that the majority of cells harbors one sgRNA/pgRNA to minimize the false-positive discovery rate [7, 12, 13]. To further reduce the FDR (false discovery rate) and increase data reproducibility, in-depth coverage of gRNAs and multiple biological replicates are often necessary to obtain the hit genes with high statistical significance , resulting in increased library size. Additional difficulties may arise when one performs a large number of genome-wide screens, when the cell materials for library construction are limited, or when one conducts more challenging screens (i.e., in vivo) for which it is difficult to arrange the experimental replications or control the MOI. To address these technical difficulties, we aimed to design a novel method that enabled us to use a high MOI to generate CRISPR libraries in target cells and to obtain improved statistics for the screening results. We hypothesized that both the false-positive and false-negative rates of high MOI screens could be drastically reduced if we had more experimental replicates for each of the gRNAs. If we assigned the gRNAs different barcodes that were somehow embedded within the gRNA sequences, we could then trace the performance of each gRNA multiple times within the same experiment by counting both the gRNAs and their internal barcode (iBAR) sequences. Two papers have recently reported methods to generate random barcodes outside the sgRNA body for pooled CRISPR screening [14, 15]. Assuming each sgRNA would create both desired loss-of-function (LOF) and non-LOF alleles, calculating all reads of any given sgRNA is unable to accurately assess the importance of its targeting gene in negative screening. Much improved statistical results could be achieved by linking one UMI (unique molecular identifier) with one editing outcome of each sgRNA to enable single-cell lineage tracing so as to lower the false-negative rate , or by counting the decreased number of RSLs (random sequence labels) affiliated with sgRNAs to improve screening quality . Different from these two methods, we aimed to develop a method through embedded iBARs to enable pooled screening with CRISPR library made of viral infection at a high MOI, so as to reduce library size and improve data quality. Ideally, the embedded iBAR should not affect the efficiency of the gRNA in guiding the Cas9 or dCas9 nuclease to the target site. We decided to place the barcode sequence in the tetra loop of the gRNA scaffold outside of the Cas9-sgRNA ribonucleoprotein complex, which has been subjected to frequent alterations for various purposes maintaining enough activity of its upstream guide sequence [11, 16]. We arbitrarily designed a 6-nt-long iBAR (iBAR6) that gave rise to 4096 barcode combinations, providing sufficient variation for our purposes (Fig. 1a). To determine whether the insertions of these extra iBAR sequences affected the gRNA activities, we constructed a library of a pre-determined sgRNA targeting the anthrax toxin receptor gene ANTXR1  in combination with all 4096 types of iBAR6. 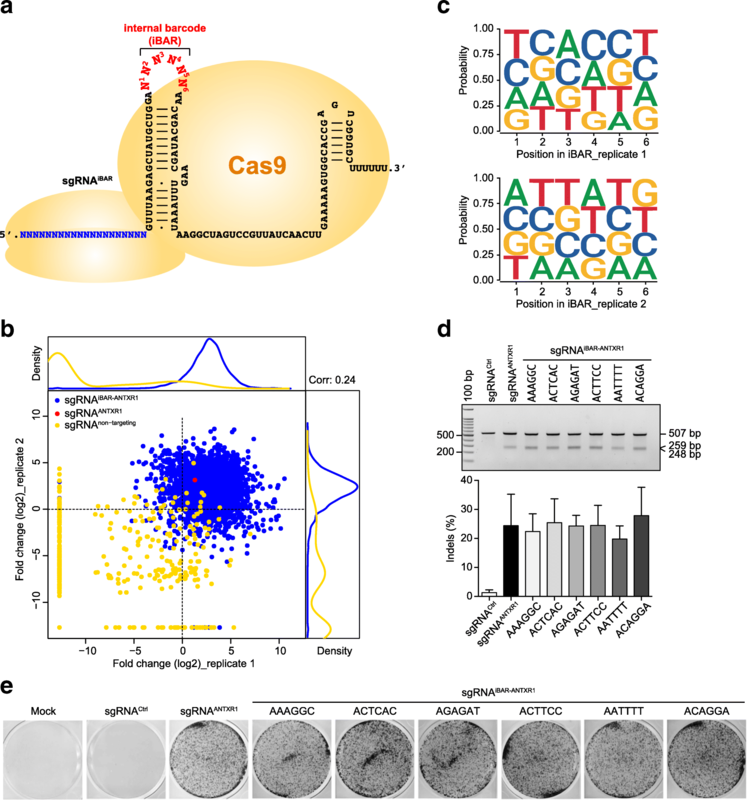 This special sgRNAiBAR-ANTXR1 library was constructed in HeLa cells that constantly express Cas9 [7, 8] through lentiviral transduction at a low MOI of 0.3. After three rounds of PA/LFnDTA toxin treatment and enrichment, the sgRNA along with its iBAR6 sequences from toxin-resistant cells were examined through NGS analysis as previously reported . The majority of sgRNAsiBAR-ANTXR1 and the sgRNAsANTXR1 without barcodes were significantly enriched, whereas almost all the non-targeting control sgRNAs were absent in the resistant cell populations. Importantly, the enrichment levels of sgRNAsiBAR-ANTXR1 with different iBAR6s appeared to be random between two biological replicates (Fig. 1b). After calculating the nucleotide frequency at each position of iBAR6, we failed to observe any bias of nucleotides from either of the replicates (Fig. 1c). Additionally, the GC contents in iBAR6 did not seem to affect the sgRNA cutting efficiency (Additional file 1: Figure S1). However, there was a small number of iBAR6s whose affiliated sgRNAANTXR1 did not perform well in either screening replicate (Additional file 2: Table S1). To rule out the possibility that these iBAR6s had negative effects on sgRNA activity, we selected six different iBARs from the bottom of the sgRNAiBAR-ANTXR1 ranking for further investigation. Compared to the control sgRNAANTXR1 without a barcode, all six of these sgRNAsiBAR-ANTXR1 showed comparable efficiency in generating both DNA double-stranded breaks (DSBs) at target sites (Fig. 1d) and ANTXR1 gene disruption leading to the toxin resistance phenotype (Fig. 1e). We further confirmed the negligible effects of iBARs on sgRNA efficiency by four different sgRNAs targeting CSPG4, MLH1, and MSH2, respectively (Additional file 1: Figure S2). Taken together, these results indicate that this re-designed sgRNAiBAR retains sufficient activity of sgRNA, making it possible to generally apply this strategy in CRISPR-pooled screens. Based on the iBAR strategy, we then set out to broaden its application to perform a novel sgRNAiBAR library screen at a high MOI. We followed the standard procedure to harvest the library cells, extract their genomic DNA for PCR amplification of sgRNA with iBAR coding regions, and perform NGS analysis [7, 12, 13]. The MAGeCK algorithm could be used to calculate the statistical significance of an sgRNA score through normalization of its raw counts, estimation of its variance using a negative binomial (NB) model, and determination of its ranking using a null model with a uniform distribution . Taking the iBAR into consideration, we assessed the consistency of any sgRNA count change among all the associated iBARs within the same experimental replicate. This process effectively eliminates free riders that were associated with functional sgRNAs due to lentiviral infection at a high MOI in cell library construction. Specifically, for the iBAR system, we purposely adjusted the model-estimated variance for only those sgRNAs whose fold changes with multiple iBARs were in opposite directions, resulting in increased P values for these outliers. Finally, we identified hit genes based on sgRNA scores and technical variance between biological replicates (Fig. 2 and “Methods” section). We developed this specific MAGeCK-based algorithm named MAGeCKiBAR for the analysis of gRNAiBAR library screening that is open source and freely available for download (“Methods” section). We then constructed an sgRNAiBAR library covering every annotated human gene. For each of the 19,210 human genes, three unique sgRNAs were designed using our newly developed DeepRank method (“Methods” section), each of which was randomly assigned four iBAR6s. In addition, 1000 non-targeting sgRNAs, each with four iBAR6s, were included as negative controls (Additional file 2: Table S2). For the ease of statistical comparison, every set of three unique non-targeting sgRNAs was artificially named a negative control gene. The 85-nt sgRNAiBAR oligos were designed in silico (Additional file 1: Figure S3), synthesized using array synthesis, and cloned as a pooled library into a lentiviral backbone. Cas9-expressing HeLa cells were transduced with the sgRNAiBAR library lentivirus at three different MOIs (0.3, 3, and 10) with 400-fold coverage for sgRNAs to generate cell libraries, in which each sgRNAiBAR was covered 100-fold. To evaluate the effect of iBAR design for CRISPR screening at different MOIs, we performed a positive screening to identify genes that mediate the cytotoxicity of Clostridium difficile toxin B (TcdB), one of the key virulence factors of this anaerobic bacillus . We have previously reported the first identification of the functional receptor of TcdB, CSPG4 , whose coding gene was also identified and ranked at the very top from a genome-scale CRISPR library screening . In this reported CRISPR screening, UGP2 gene was also top-ranked hit, and FZD2 was identified and confirmed to encode the secondary receptor that mediates the TcdB’s killing effect on host cells. Of note, the role of FZD2 was significantly dwarfed by CSPG4 so that the FZD2 gene could only be identified using the truncated TcdB that had CSPG4-interacting region deleted . In our screens on TcdB, we used MAGeCKiBAR (Additional file 2: Table S3) and MAGeCK (Additional file 3: Table S4) to analyze data from iBAR and the conventional CRISPR screens, respectively. We consequently obtained top-ranked genes (FDR < 0.15) from both. For screening at a low MOI of 0.3, CSPG4 and UGP2 were identified and ranked at the top (Fig. 3a), consistent with the previous report . When taking iBARs into account, we identified FZD2 in addition to CSPG4 and UGP2 (Fig. 3b). Because FZD2 is a proven receptor of TcdB which plays much weaker role than CSPG4 in HeLa cells , these results demonstrated that iBAR method offered superior quality and sensitivity to conventional CRISPR screening when constructing cell library at a low MOI. In addition, rankings of CSPG4 and UGP2 were far more consistent in CRISPRiBAR screening between two experimental replicates, again indicating the much higher quality for the new method (Fig. 3a, b). At high MOIs (3 and 10), CSPG4 and UGP2 could be isolated from both CRISPR and CRISPRiBAR screens, but the data quality was significantly higher with the latter (Fig. 3c–f). In general, the higher the MOI, the worse the signal-to-noise rate for the traditional method. At a MOI of 10, the number of false-positive hits was drastically increased in the conventional method, but not in CRISPRiBAR screening (Fig. 3e, f). Impressively, CSPG4 and UGP2 remained top ranked from CRISPRiBAR screening even at an MOI of 10, although the data quality slightly declined (Fig. 3f). Noticeably, nearly all CSPG4- and UGP2-targeting sgRNAsiBAR were significantly enriched after TcdB treatment (Additional file 1: Figure S4), strikingly different from other genes identified at an MOI of 10 using conventional method, such as SPPL3, a likely false-positive result (Additional file 1: Figure S4). 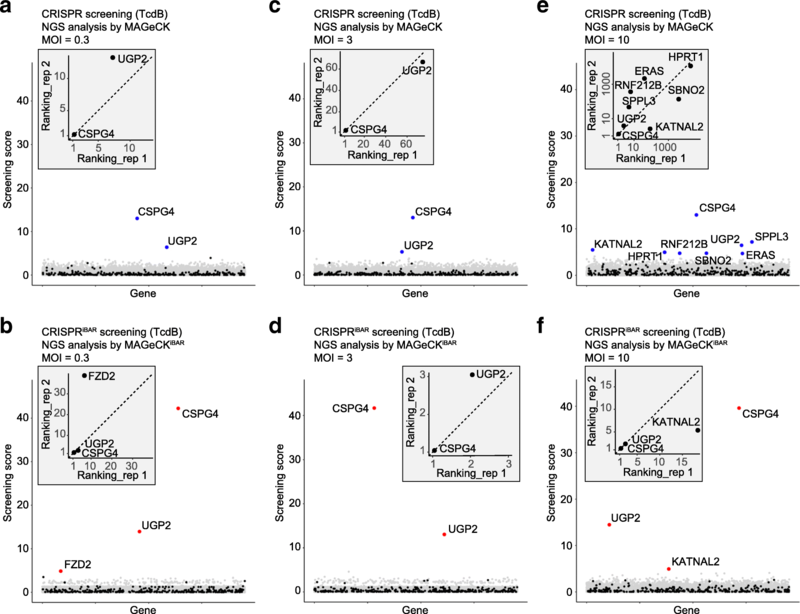 In comparison of the two biological replicates, CSPG4 and UGP2 were all ranked at the top in both biological replicates from CRISPRiBAR screens with all MOI conditions (Fig. 3b, d, f), but not from the conventional CRISPR screens where UGP2 was ranked lower than 60th in both replicates at an MOI of 3 (Fig. 3c) and many false-positive hits appeared in both replicates at an MOI of 10 (Fig. 3e). These results showed that iBAR method maintained the quality of data even at a high MOI as that at a low MOI for conventional CRISPR screening. Additionally, iBAR approach enables highly repeatable results between biological replicates as multiple replications could be conducted within one experiment (Fig. 3). To further evaluate the power of iBAR method, we went on conducting a screening to identify genes that modulate cellular susceptibility to 6-TG , a cancer drug that could be processed to inhibit DNA synthesis. We decided to construct the genome-scale sgRNAiBAR library at a MOI of 3 to generate a cell library with high coverage (2000-fold) for each sgRNA, in which each sgRNAiBAR was covered 500-fold. The overall read distribution of both experimental replicates was shown (Additional file 1: Figure S5a), and the reference cell libraries of both replicates reached 97% coverage of all originally designed sgRNAs (Additional file 1: Figure S5b). Over 95% of the sgRNAs in the original libraries retained three to four iBARs, indicating the good quality of libraries in which most sgRNAs had sufficient barcode variants for screening and data analysis (Additional file 1: Figure S5c). The fold change of all genes correlated well between the two biological replicates (Additional file 1: Figure S6). For the same 6-TG screening of two sgRNA library replicates, we also employed MAGeCK and MAGeCKiBAR analyses. For MAGeCKiBAR, we consequently obtained adjusted variance and mean distributions for all the sgRNAsiBAR that heightened the variance of sgRNAs with enrichment inconsistent among different iBAR repeats (Additional file 1: Figure S7). From the positively selected sgRNAs with statistical significance, we identified the top-ranked genes (FDR < 0.15) whose corresponding sgRNAs were consistently enriched among different iBARs (Fig. 4a, Additional file 3: Table S5), and we also found these top genes using the MAGeCK algorithm without taking barcodes into account (Fig. 4b, Additional file 3: Table S6). Consistent with a previous report , the sgRNAs targeting HPRT1 gene were top ranked by both methods. Four genes (MLH1, MSH2, MSH6, and PMS2) were previously reported to be involved in 6-TG-mediated cell death . We examined and confirmed the cutting activities of all except one of the primary designed sgRNAs targeting these four genes (Additional file 1: Figure S8), indicating that these genes were indeed irrelevant to 6-TG-mediated cell death in HeLa cells we used (Fig. 4c). When analyzing the two biological replicates separately, the top 20 genes of each replicate showed a high level of consistency with CRISPRiBAR screening (Spearman correlation coefficient for rankings = 0.74), whereas the two replicates shared much less commonality when using the conventional method (Spearman correlation coefficient for rankings = − 0.09) (Fig. 4d, Additional file 3: Table S7). To validate the screening results, we de novo designed and combined two sgRNAs to make a mini-pool to target each candidate gene, and each pool was introduced into HeLa cells through lentiviral infection (Additional file 3: Table S8). The effects of the sgRNA pools on cell viability against 6-TG treatment were quantified by a 3-(4,5-dimethyl-2-thiazolyl)-2,5-diphenyl-2-H-tetrazolium bromide (MTT) assay. Top 10 genes from CRISPRiBAR as well as CRISPR screens were chosen for validation. Noticeably, two non-targeting control genes were identified and ranked in the top 10 candidate list from the conventional CRISPR screen (Additional file 3: Table S6). These evident false-positive results are predictable because of the high MOI we used to generate the cell library. We successfully confirmed that the top 10 candidate genes from CRISPRiBAR of both replicates were all true-positive results; in contrast, only five genes from the top 10 candidate list from the conventional method turned out to be true positives (Fig. 4e). Among them, four genes (HPRT1, ITGB1, SRGAP2, and AKTIP) were obtained using both methods, whereas six genes (ACTR3C, PPP1R17, ACSBG1, CALM2, TCF21, and KIFAP3) were only identified and ranked at the top from CRISPRiBAR. In summary, iBAR improved accuracy with lower false-positive and false-negative rates for high MOI screens compared with conventional method. We further assessed the performance of each sgRNAiBAR targeting the top four candidate genes (HPRT1, ITGB1, SRGAP2, and AKTIP). All the different iBARs of the enriched sgRNAs appeared to have little effect on the enrichment levels of their affiliated sgRNAs, and the order of iBARs associated with any particular sgRNA appeared to be random (Additional file 1: Figure S9), further supporting our prior notion that the iBARs did not affect the efficiency of their affiliated sgRNAs. All four HPRT1-targeting sgRNAsiBAR were significantly enriched after 6-TG treatment in both replicates (Fig. 4f). Most sgRNAsiBAR of other CRISPRiBAR identified genes were enriched after 6-TG selection (Additional file 1: Figure S10). In contrast, only a very few of sgRNAsiBAR of some top-ranked genes from conventional CRISPR screening were enriched, including FGF13 (Fig. 4g), GALR1, and two negative control genes (Additional file 1: Figure S11), leading to false-positive hits in the MAGeCK but not MAGeCKiBAR analysis (Additional file 1: Figure S12). The library coverage was significantly increased with a high MOI in the transduction with a fixed number of cells for library construction, so the starting cells for library construction could be decreased more than 10-fold (MOI = 3) and 35-fold (MOI = 10) to match and even top the results from conventional screening at an MOI of 0.3 (Additional file 3: Table S10). Four barcodes for each sgRNA, as we designed, appeared to provide sufficient internal repeats to enable the high level of consistency between the two biological replicates using the iBAR method (Fig. 3, Fig. 4d, Additional file 3: Table S7). Therefore, in addition to the significant reduction in cells for library construction, the internal replicates offered by iBARs within the same experiment would lead to more uniform conditions and fairer comparisons versus separate biological replicates, consequently improving statistical scores. The advantage of the iBAR method would become greater when large-scale CRISPR screens in multiple cell lines are in demand or when the cell samples for screening are scarce (i.e., samples from patients or those of primary origin). Especially for in vivo screening in which the lentiviral transduction rate is hard to predict and variable conditions in different animals might greatly impact the screening outcomes, the iBAR method could be an ideal solution to resolve these technical limitations. Because multiple cuttings decrease cell viability, CRISPR library constructed at a high MOI might have abnormal false discovery rate for negative screening [24, 25]. We therefore performed a genome-scale negative screening at an MOI of 0.3 to assess the iBAR method in calling essential genes. For positive screening using iBAR, we modified the model-estimated variance of sgRNAs with different fold change directions among barcodes to enlarge variance so that the mis-associated sgRNAs were subjected to adequate penalty. For negative screening, however, sgRNA depletion through mis-association had little effect on its consistency of fold change directions as non-functional sgRNAs remained unchanged. Therefore, we treated barcodes only as internal replicates without the penalty procedure. We indeed achieved improved statistics with higher true-positive and lower false-positive rates for negative screening using iBAR method at a low MOI than the conventional approach using gold standard essential genes  (Additional file 1: Figure S13). Notwithstanding the technical advancement of the iBAR method to offer the same benefit of internal replications, we must be cautious with the MOI during viral transduction to generate the original cell library in negative screens based on measuring cell viability. Although massive integrates have been reported not to affect cell fitness , multiple cuttings on DNA caused by higher MOI in cells with active Cas9 have been shown to reduce cell viability [24, 25]. Strategies without cuttings, such as CRISPRi/a  or iSTOP systems , could be better choices to combine with the iBAR system for negative screening at a high MOI. Although we had data to support that iBAR6 had little effect on the activities of sgRNAs, we would not recommend to use barcodes with consecutive T (> 4) so as to avoid any minor effects. Ultimately, 4096 types of iBAR6 provided sufficient varieties to make CRISPR libraries. In addition, the length of the iBAR is not limited to 6 nt. We have tested different lengths of iBARs and found that their lengths could be up to 50 nt without affecting functions of their affiliated sgRNAs. (Additional file 1: Figure S14). In addition, it is not necessary to design different barcode sets for different sgRNAs. A fixed set of iBARs assigned to all sgRNAs should work as well as random assignment in library screening. Our iBAR strategy with a streamlined analytic tool MAGeCKiBAR would facilitate large-scale CRISPR screens for broad biomedical discoveries in various settings. HeLa and HEK293T cell lines were maintained in Dulbecco’s modified Eagle’s medium (DMEM; Gibco C11995500BT) supplemented with 1% penicillin/streptomycin and 10% fetal bovine serum (FBS; CellMax BL102-02) and cultured with 5% CO2 at 37 °C. All cells were checked for the absence of mycoplasma contamination. The lentiviral sgRNAiBAR-expressing backbone was constructed by changing the position of the BsmBI (Thermo Scientific™, ER0451) site using BstBI (NEB, R0519) and XhoI (NEB, R0146) from Plenti-sgRNA-Lib (Addgene, #53121). sgRNA- and sgRNAiBAR-expressing sequences were cloned into the backbone using the BsmBI-mediated Golden Gate cloning strategy . Gene annotations were retrieved from the UCSC hg38 genome, which contains 19,210 genes. For each gene, three different sgRNAs that had at least one mismatch in the 16-bp seed region in the genome with a high level of predicted targeting efficiency were designed using our newly developed DeepRank algorithm. We then randomly assigned four 6-bp iBARs (iBAR6s) to each sgRNA. We designed an additional 1000 non-targeting sgRNAs, each with four iBAR6s, to serve as negative controls. The 85-nt DNA oligonucleotides were designed and array synthesized. Primers (oligo-F and oligo-R) targeting the flanking sequences of oligos were used for PCR amplification. The PCR products were cloned into the lentiviral vector constructed above using the Golden Gate method . The ligation mixtures were transformed into Trans1-T1 competent cells (Transgene, CD501-03) to obtain library plasmids. Transformed clones were counted to ensure at least 100-fold coverage for the scale of the sgRNAiBAR library. The library plasmids were extracted following the standard protocol (QIAGEN 12362) and transfected into HEK293T cells with the two lentivirus package plasmids pVSVG and pR8.74 (Addgene, Inc.) to obtain the library virus. The iBAR library containing all 4096 iBAR6s for one ANTXR1-targeting sgRNA was constructed using the same protocol. A total of 2 × 107 cells were plated on 150-mm Petri dishes and infected with the library lentivirus at an MOI of 0.3. After 72 h of infection, cells were re-seeded and treated with 1 μg/ml of puromycin (Solarbio P8230) for 48 h. For each replicate, 5 × 106 cells were collected for genome extraction. Screening of the sgRNAiBAR-ANTXR1 library was performed using PA/LFnDTA toxin [30, 31] after library-infected cells were cultured for 15 days . Then, sgRNA with the iBAR coding region in genomic DNA was amplified (TransGen, AP131-13) using Primer-F and Primer-R and then subjected to high-throughput sequencing analysis (Illumina HiSeq2500) using an NEBNext Ultra DNA Library Prep Kit for Illumina (NEB E7370L). A total of 1.6 × 108 cells (MOI = 0.3), 1.53 × 107 cells (MOI = 3), and 4.6 × 106 cells (MOI = 10) were plated on 150-mm Petri dishes respectively for sgRNA library construction for two replicates. Cells were infected with the library lentivirus of different MOIs and treated with 1 μg/ml of puromycin for 72 h post infection. sgRNAiBAR-integrated cells were cultured for an additional 15 days to maximize gene knockout. Cells were re-seeded onto 150-mm Petri dishes, treated by TcdB (100 pg/ml) for 10 h, and followed by the removal of the loosely attached round cells through repeated pipetting . For each round of screening, the cells were cultured in fresh medium without TcdB to reach ~ 50–60% confluence. All resistant cells in one replicate were pooled and subjected to another round of TcdB screening. For the subsequent three rounds of screening, the TcdB concentration was 125 pg/ml, 150 pg/ml, and 175 pg/ml, respectively. After four rounds of treatment, the resistant cells and untreated cells were collected for genomic DNA extraction, amplification of sgRNA, and NGS analysis. Seven pairs of primers were used for PCR amplification (Additional file 3: Table S9), and PCR products were mixed for NGS. For negative screening at an MOI of 0.3, a total of 4.6 × 107 (two replicates) sgRNAiBAR-integrated cells were cultured for 28 days before NGS decoding. A total of 5 × 107 cells were plated on 150-mm Petri dishes, and two replicates were obtained. Cells were infected with the library lentivirus at an MOI of 3 and treated with 1 μg/ml puromycin 72 h after infection. sgRNAiBAR-integrated cells were cultured for an additional 15 days, re-seeded at a total number of 5 × 107, and then treated with 200 ng/ml 6-TG (Selleck). For the following two rounds of screening, the 6-TG concentration was 250 ng/ml and 300 ng/ml. For each round of selection, the drug was maintained for 7 days, and the cells were cultured in fresh medium without 6-TG for another 3 days. Then, all the resistant cells in one replicate were grouped together and subjected to another round of 6-TG screening. After three rounds of treatment, the resistant cells and untreated cells were collected for genomic DNA extraction, amplification of sgRNA with iBAR regions, and deep-sequencing analysis. MAGeCKiBAR is the analysis strategy developed for screens using an sgRNAiBAR library based on the MAGeCK algorithm . MAGeCKiBAR takes great advantage of Python, Pandas, NumPy, and SciPy. The analysis algorithm contains three main parts: analysis preparation, statistical tests, and rank aggregation. In the analysis preparation stage, the inputted raw counts of sgRNAsiBAR are normalized, and the coefficients of the population mean and variance are then modeled. In the statistical test stage, we use tests to determine the significance of the difference between the treatment and control normalized reads. In the rank aggregation stage, we aggregate the ranks of all the sgRNAsiBAR targeting each gene to obtain the final gene ranking. The means of the treatment and control counts were calculated directly, and the corresponding variance could be calculated from the mean and coefficients. For the CRISPR-iBAR analysis, we evaluated the enrichment of sgRNAs through the performances of different iBARs. We designed four iBARs for each sgRNA to serve as internal replicates. Due to the high MOI during library construction, there must be free riders of false-positive sgRNAs associated with true-positive hits. The free rider here was used to describe the sgRNAs targeting irrelevant genes that were mis-associated with functional sgRNAs to enter the same cells. We modified the variance of sgRNAsiBAR based on the enrichment directions of different iBARs for each sgRNA. If all the iBARs of one sgRNA presented the same direction of fold change, i.e., all greater or less than that of the control group, then the variance would be unchanged. However, if one sgRNA with different iBARs revealed inconsistent directions of fold change, then this kind of sgRNA would be penalized by increasing its variance. The final adjusted variance for inconsistent sgRNAsiBAR would be the model-estimated variance plus the experimental variance calculated from the Ctrl and Exp samples. where ti is the mean of the treatment counts of the ith sgRNA and ci and vi are the mean and variance of control counts of the ith sgRNA. Because the variance is used as the denominator to calculate the score, the enlarged variance for the inconsistent sgRNAsiBAR results in lower score. The normal distribution was used to test the scorei of the treatment counts. The two sides of scores in a standard normal distribution provided the greater-tail and lesser-tail P value separately. To obtain the gene ranks, we used RRA, which is an appropriate method for aggregating rankings . MAGeCK adopted a modified RRA method by limiting the enriched sgRNAs . Suppose for one gene there are n sgRNAs with different iBARs in the library of M sgRNAsiBAR in total; every sgRNAiBAR has a rank in the library of R = (R1, R2, … , Rn). First, the ranks of sgRNAsiBAR should be normalized by the total number of sgRNAsiBAR in the library. We obtained the normalized rank r = (r, r2, … , rn) for each ri = Ri/M, in which 1 ≤ i ≤ n. Then, we calculated the sorted normalized ranking sr, making sr1 ≤ sr2 ≤ … ≤ srn. The sorted normalized rank follows a uniform distribution between 0 and 1. The probability βk, n(sr) in which sri ≤ ri follows a β distribution β(k, n + 1 − k), making ρ = min(β1, n, β2, n, … , βn, n). For every gene, the ρ score can be obtained by RRA and further adjusted by Bonferroni correction . We adopted MAGeCK, which developed α-RRA, to select the top α% sgRNAs from the ranking list. The P values of sgRNAs lower than a threshold (0.25 for instance) were selected. Only the top sgRNAs of one gene were considered in the RRA calculation, thus making ρ = min(β1, n, β2, n, … , βj, n), in which 1 ≤ j ≤ n.
During the analyzing process of positive screening at high MOI based on the iBAR strategy, we modified the model-estimated variance of sgRNAs with different fold change directions among corresponding barcodes. But for negative screening, most of the non-functional sgRNAs would be unchanged. So the variance modification algorithm based on fold change directions of corresponding barcodes becomes not sufficient to justify weather certain sgRNA is a false-positive result. Therefore, we treated barcodes as internal replicates directly. When taking iBAR into consideration, we performed two times robust rank aggregation for the negative screening rather than variance adjustment for the inconsistent sgRNAsiBAR. The first round of robust rank aggregation aggregates the sgRNAiBAR level to sgRNA level, and the second round aggregates the sgRNA level to gene level. To validate each gene, we chose two sgRNAs designed in the library and cloned into a lentiviral vector with a puromycin selection marker. We mixed two sgRNA plasmids and co-transfected them into HEK293T cells with two lentiviral package plasmids (pVSVG and pR8.74) using the X-tremeGENE HP DNA transfection reagent (Roche). The HeLa cells stably expressing Cas9 were infected with the lentivirus for 3 days and treated with 1 μg/ml puromycin for 2 days. Then, 5000 cells were added into each well, and five replicates were obtained for each group. After 24 h, the experimental groups were treated with 150 ng/ml 6-TG, and the control groups were treated with normal medium for 7 days. Then, MTT (Amresco) staining and detection were performed following the standard protocol. The experimental wells treated with 6-TG were normalized to the wells without 6-TG treatment. Shiyou Zhu, Zhongzheng Cao, Zhiheng Liu and Yuan He contributed equally to this work. We acknowledge the staff of the BIOPIC sequencing facility (Peking University) for their assistance. The process of data analysis was supported by High-performance Computing Platform of Peking University. We thank the support of National Post-doctoral Innovative Talent Supporting Program. This project was supported by funds from the National Science Foundation of China (NSFC31430025), the Beijing Advanced Innovation Center for Genomics at Peking University, and the Peking-Tsinghua Center for Life Sciences (to W.W.); the National Major Science & Technology Project for Control and Prevention of Major Infectious Diseases in China (2018ZX10301401, to S.Z.). WW conceived and supervised the project. WW, SZ, ZC, and PY designed the experiments. SZ, ZC, and YH performed the experiments with the help from FT and YB. YW designed the oligos used to construct the iBAR library. ZL performed the data analysis with the help of WL. SZ, ZC, ZL, YH, and WW wrote the manuscript with the help of the other authors. All authors read and approved the final manuscript. A patent has been filed relating to the data presented, which would not limit the academic use of the data and the method. W.W. is a founder and scientific advisor for EdiGene. All other authors declare that they have no competing interests. Zhu S, Cao Z, Liu Z, He Y, Wang Y, Yuan P, Li W, Tian F, Bao Y, Wei W. Guide RNAs with embedded barcodes boost CRISPR-pooled screens. Bitbucket Software. https://bitbucket.org/WeiLab/mageck-ibar/.